coffee and quilts go hand in hand. my hubby and i are big coffee drinkers. all of the baristas at our local Biggby know us and our girls pretty well. during the week, the girls and i spend a bit of time in the morning hanging out at BB (as Nora tends to call it). well the manager of our store is getting married this coming weekend. 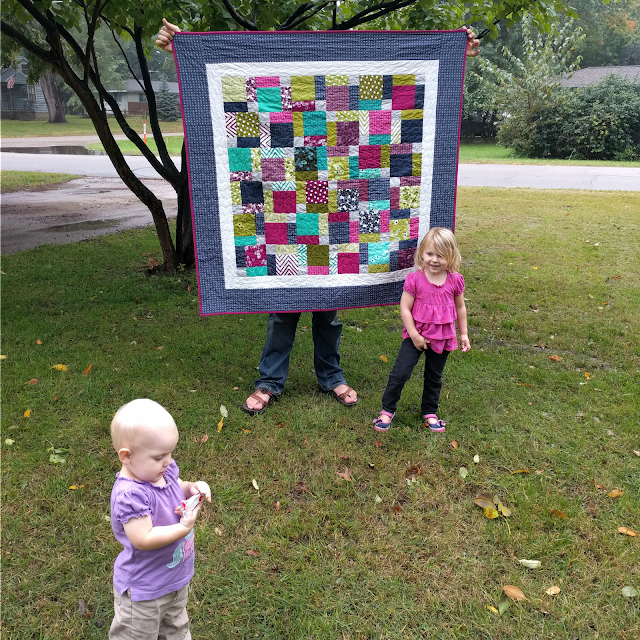 and since my girls love her and she loves on my girls, i decided to search through my stash and make her a quilt. i had a couple Simply Colorful II charm packs that i knew would be perfect for her since she loves blue and purple. so i had my charm packs, now what to make as I was trying to keep to what i had in my stash. as i'm trying to keep to a pretty light fabric budget as of late. finally after searching for a few days i landed on a disappearing nine patch after watching the video tutorial from Missouri Star. i love a quilt pattern that takes time, but i'll tell you what, when i can make a quilt top in just one afternoon of the girls napping and playing that makes for one happy mama! after i pieced my blocks together i knew i was going to have to purchase some fabric for borders. but i'm happy to say that is the only fabric i needed to purchase for this quilt. besides the borders, everything came from my stash! i kept the quilting simple, with a serpentine stitch and one accent set of stitching. i am finding that i enjoy the piecing and i like simple quilting. at this point i just don't have the time to do some of the detailed quilting that i admire, maybe one day. here are a few outtakes from shooting this quilt. Nora loves to try and get into all of the photos. as you can see from the first pictures she had to help daddy hold the quilt. Enna had to join the fun as well. 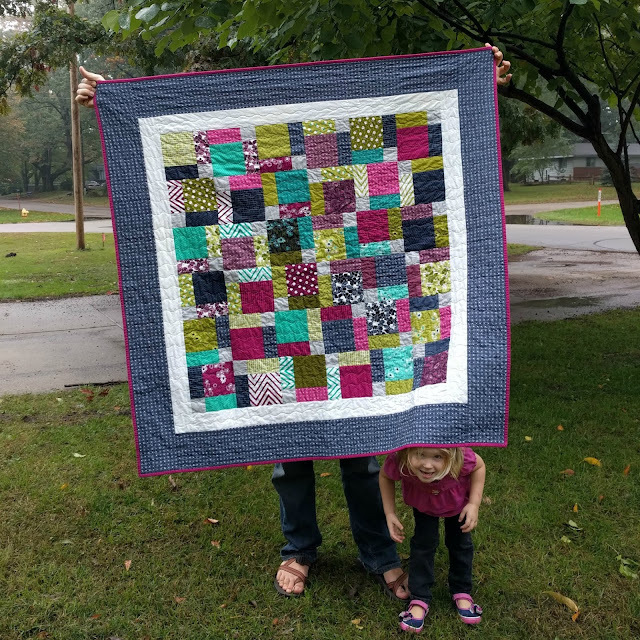 the gloomy day made for difficult pictures, but i wanted to get the pictures takes, since we are giving her the quilt when we visit Biggby on Monday. 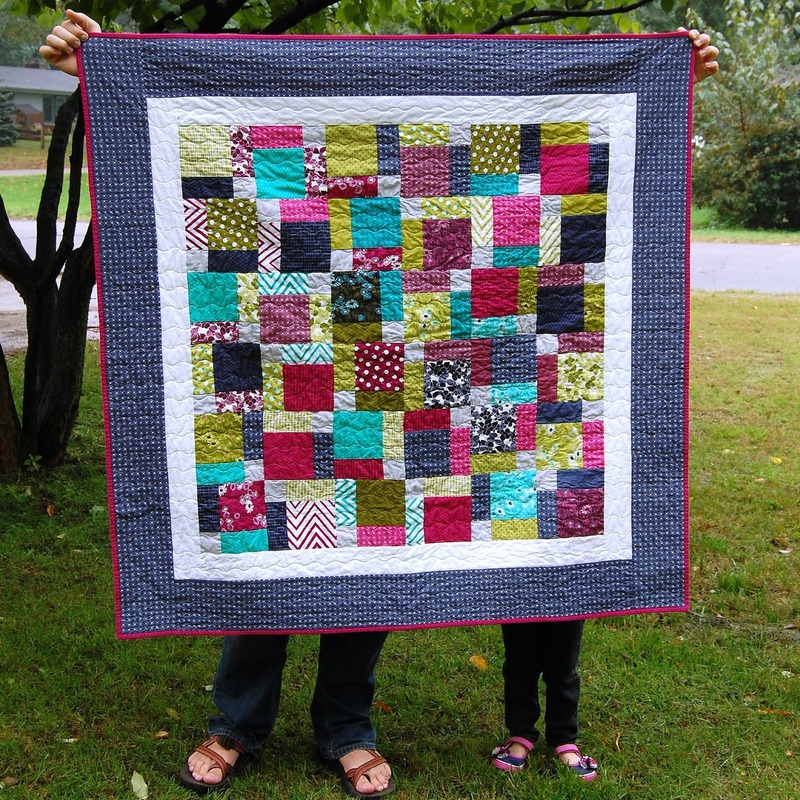 Linking up with Sew Fresh Quilts for Let's Bee Social and Crazy Mom Quilts for Finish it Friday! It's really hard for me to get good photos of my quilts, too. I like the ones with the kids. Great quilt, too. A lovely finish! And very cute pics, especially #1 pic of your quilt holders!